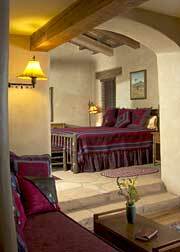 If you’re thinking about a trip to Sedona, AZ, come and stay at El Portal Sedona Hotel. 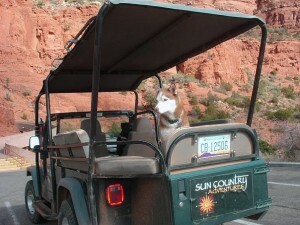 Not only are we the original pet friendly Sedona hotel, but a AAA Four Diamond hotel as well. I love El Portal. The rooms that we booked for our family vacation were huge and beautifully decorated with antique.s We had the latest DVDS to choose from in the library. The king sized bed was super comfortable and we all slept really well. The shower was so super that I really didn’t want to get out. Breakfast are very special, try the huevos rancheros. I loved my view of the red canyons. To get around town is a breeze. Steve, the owner is a real sweetheart and was there every day, always suggesting a great idea for us on where to hike, get a special piece of Indian art, the best way to see the Grand Canyon or simply a restaurant in our price range with great food. The places that he suggested were always spot on! It was so good to see that folks with pets are so welcome at El Portal. Steve, Connie and Fran make EVERYONE feel so welcome. I had a FANTASTIC time there. It was hard to say goodbye. Check out our Sedona hotel specials here!